Package 1 – Devil’s Lake State Park: A less demanding Outpost perfect for participants who desire the amenities of a state park, such as flush toilets, showers, and drive-up loading/unloading. Group campsite maximum capacities are 20 and 30 people. The group campground is located approximately one half mile from the south shore area of the lake. The trail network of the east bluff is easily accessed across the road from the group campground. 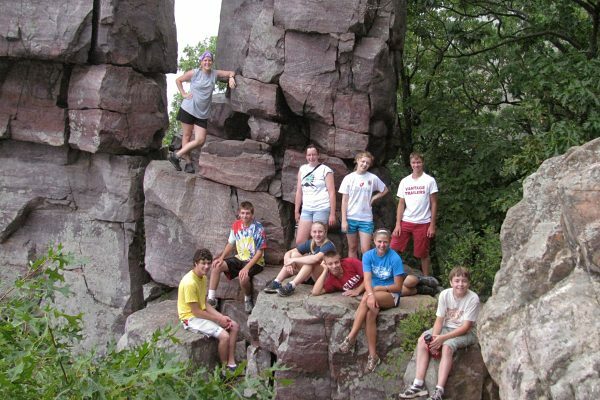 Some popular activities commonly enjoyed on the Devil’s Lake Outpost are: hiking, swimming, canoeing, half day hike to the park nature center and recreational activities on the south shore play fields. Drive time to the group campground from Upham Woods is about 35 minutes. Package 2 – Mirror Lake State Park: A less demanding Outpost perfect for participants who desire the amenities of a state park, such as flush toilets, showers, and easy vehicle loading/unloading. Group campsite maximum capacities are 20 people per site. The group campground is centrally located and in close proximity to hiking trails, swimming beach, canoe ramp, and play field. One of the best ways to enjoy the lake is by canoe. Some other popular activities commonly enjoyed on the Mirror Lake Outpost are: hiking, swimming and recreational activities on the play fields. Drive time to Mirror Lake State Park from Upham Woods is about 15 minutes. Package 5 – Blackhawk Island Base Camp Canoeing: A canoe-based Outpost that feels remote but is never far from main camp. Participants paddle from and back to main camp so vehicular transportation of participants is not needed. Participants will be required to portage equipment to the campsite and utilize wilderness bathroom techniques. This Outpost is easily combined with main camp accommodations, meals, and activities so it can be customized into a one, two or three night Outpost. Group size is limited to 20-30 participants, depending on the adventure. We can transport canoes and gear but not participants. Interested in our Outpost trips? Fill out an online application and associated Outpost Forms or feel free to call us at 608-254-6461 with any questions.